A foldable four-axis drone allows you to keep your pocket at all times. 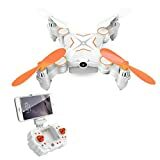 Affordable mini drone with deformable wings,easy to carry around,equipped with a HD 1MP camera to record every unforgettable memory ,compatibility with both IOS and Android operating systems allows you to fly this mini drone and snap pictures straight from your smartphone suitable for both indoor and outdoor use – this drone is the perfect toy for children and adults alike Mini drone with Built-in HD Camera.Are you ready to see the world from an entirely new perspective?With the affordable mini-drone you will be able to fly away and capture sharp pictures and video.It captures and records your every unforgettable moment from a complete different perspective than ever before.You are sure to share all your family happiness and precious childhood experiences.When you use remote control to control the drone,this mini-drone is capable to fly up to 100 meters away from you,giving you a clear and live overview of what lays ahead without risking your own safety. Now,wear your VR equipment to feel different scenery. This FPV quadcopter only fit for age above 14+ experienced users.Before assemble the drone,please read the user manual first to know the assembling procedure and how to operate it. This entry was posted in Discount Photography and tagged 720P, Camera, Control, Drone, Foldable, Helicopter, Mini, PowerLead, Quadcopter, Remote, WiFi by Ball Photo. Bookmark the permalink.